Toronto, ON. April 3, 2019 - This Saturday April 6th, Canada Running Series will welcome almost 4,000 runners and walkers to beautiful High Park for opening day of the nation's most-popular running circuit. This is a special year for Canada Running Series marking its 30thanniversary and the 42ndanniversary of the race which led the Series in 1990. The Series includes 8 events across Toronto, Montreal, Edmonton, and Vancouver. The annual local favourite includes an 8K, 5K and an 800m Kids Run, with lively cheer stations on site thanks to Tribe TO, and the High Park Rogue Runners. This year's race features some epic competition in both the women's and men's events. The women's lineup promises a thrilling confrontation through the hills of High Park (#KillTheHill). Scottish-Canadian Sarah Inglis, who set a national 5K "all-comers" record of 15:29 just a few weeks ago, will be battling Canadian national team member Sasha Gollish and Olympic marathon hopeful, Dayna Pidhoresky, who won the Spring Run-Off in 2011. The women will also be joined by this year's Around the Bay champions Mengistu Emebet and Gladys Tarus. Winners of the 30K and 5K distances, respectively. With an unbroken women's record since 1990 by Jill Hunter (25:56), it will be a competitive race amongst athletes and against the clock! On the men's side, Ottawa's Tristan Woodfine will have to fight off Toronto local Kyle Grieve in order to claim his hat trick of victories at this year's SRO. They will be joined at the starting line by Canadian Sports Science author and Masters' competitor, Alex Hutchinson. 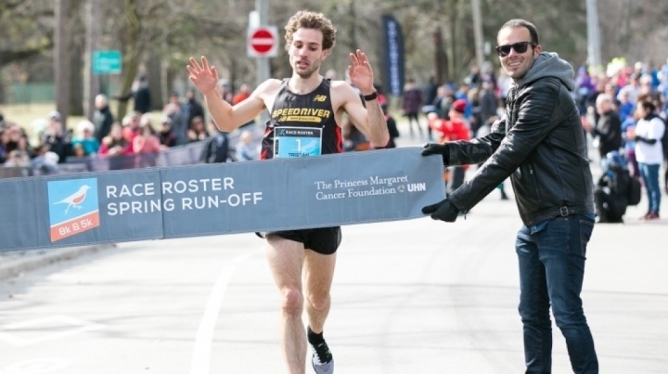 For the 14th year, all registered runners and walkers are invited to raise funds to support anyarea of cancer research, clinic, lab, fund or patient-care program at The Princess Margaret Cancer Centre. The fundraising total for the past 14 years has surpassed $3.175 million! Post-race, participants can enjoy a $5 pancake breakfast, hosted by the Grenadier Café in support of the High Park Nature Centre. All runners are also invited to the after-party at Hendersonswhere a free beer for registered participants awaits. Pancakes will be served in the Party Site from 9:30 a.m. until 12:30 p.m. with beers at Hendersons until 1.p.m. MP Arif Virani will officially start the 5K race while Councilor Michael Colle will be recognized at the start of the 8K race. Runners can still register online until April 5th. Community members and spectators are invited to cheer and support the runners and walkers in High Park. It says "Ottawa's Tristan Woodfine". Did Tristan move to Ottawa? I ran cross country in high school and yet that is the toughest hill I'll ever conquer. Am I just getting old or does anyone else feel the same?